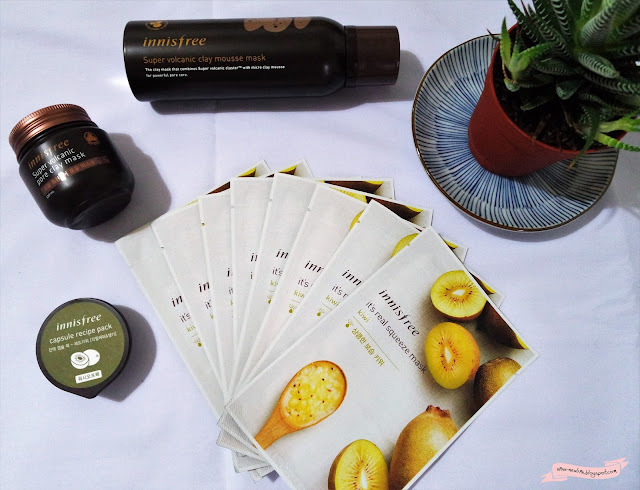 On last 2 years ago, I have been exposure about the Korea product from Innisfree brands. The Innisfree Super Volcanic Clay Mask is among of the best seller product. A 6-in-1 pore treatment clay mask containing super volcanic cluster to effectively absorb sebum and cleanse pores. 6-in-1 Pore care mean is shrinks pores, controls sebum, exfoliates, deeply cleanses, brightens tone, & cools. It's strong removal of sebum. Thanks to the super volcanic capsules. As the capsule bursts, the mask exfoliates and removes dead skin cells. The AHA ingredient chemically exfoliates and smoothes out skin. The strong absorption of sebum and cooling effect of the clay refreshes the skin and contracts pores. Normally, I use this mask in 2 times a week so I can keep my skin look clean and healthy. After cleansing, I gently apply a toner on my face to even out my skin texture. Then, I apply the mask over my entire face but I avoiding my eyes and lip areas. I wait until the mask dry before I rinse off the mask with lukewarm water. I also using the mask to scrub my face for removing the dead skins. Actually, the Innisfree Super Volcanic Mousse Mask is same with the Innisfree Super Volcanic Clay Mask for me. The Innisfree Super Volcanic Mousse Mask is a mask with Micro Clay Mousse containing Super Volcanic Clusters, which is effective at absorbing sebum and fine dust stick between small pores and wrinkles. The different between the Innisfree Super Volcanic Mousse Mask and the Innisfree Super Volcanic Clay Mask is textures of this mask. The Innisfree Super Volcanic Mask textures are like clay. So it takes time to apply this clay on the face, especially to apply over the face. I have to make sure my entire face is cover with the Innisfree Super Volcanic Clay Mask. Rather than the Innisfree Super Volcanic Mousse Mask. The Innisfree Super Volcanic Mousse Mask is easier to apply over the face and it saves time too. For me, I like the Innisfree Super Volcanic Mousse Mask. But I still use both of these products until today for my skincare routines. Then after I wash my face from the Innisfree Super Volcanic Mousse Mask or the Innisfree Super Volcanic Clay Mask, I will apply again the toner and then the Innisfree Kiwi Mask Sheet for make my face bright and moistures.